Wesley Snipes was sent to New York's High School of the Performing Arts after a junior high teacher was impressed with his performance in a school production of Alice in Wonderland, with Snipes as Alice. When his family moved to Florida, Snipes made new friends and quickly organized them into a song, dance, and puppetry act called Struttin’ Street Stuff, performing on sidewalks and in parks. After studying drama at a New York college, he played a pimp on an episode of Miami Vice, a tough guy in the video for Michael Jackson's "Bad," and made his movie debut playing high school football for coach Goldie Hawn in Wildcats. In 1990, he played a heroic Harlem cop in a short-lived TV show, HELP with a pre-Frasier John Mahoney, but Snipes came to fame on the other side of the law, playing the crack cocaine kingpin of New Jack City with Mario Van Peebles. His biggest hits include Blade and its sequels, Demolition Man with Sylvester Stallone, Rising Sun with Sean Connery, White Men Can't Jump and Money Train with Woody Harrelson, and Passenger 57 with Tom Sizemore. He had memorable supporting roles in US Marshals with Tommy Lee Jones, Waiting to Exhale with Angela Bassett, and Abel Ferrara's King of New York with Christopher Walken. He starred in two of Spike Lee's early films, Mo' Better Blues with Denzel Washington and Jungle Fever with Annabella Sciorra. Snipes is a fifth degree karate Black Belt, and also practices the Brazilian martial art capoeira. He choreographed the martial arts fights for Blade, and hosted Masters of the Martial Arts on Turner Network Television. 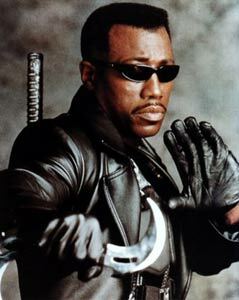 In 2004, while filming his third Blade feature, the film's director said Snipes threatened to kill him because his character did not have enough fight scenes. His co-stars commented that they were concerned when Snipes remained in character as the brooding vampire all day every day, from the moment he arrived on the set. In recent years, Snipes has made news more often for off-screen incidents than for his big-screen outings. In 2001, he argued with staff at the Mandalay Bay Hotel in Las Vegas after a reservations mix-up, and wrestled with hotel security guards until he was arrested and briefly jailed. Later that year, Snipes' apartment near New York's World Trade Center was rendered uninhabitable due to structural damage from the attacks of 9/11. In 2003 and again in 2005, homes owned by Snipes were seized after he stopped making mortgage payments. In 2004, he was accused of beating Halle Berry years earlier, when they briefly dated. In 2005, a warrant was issued for Snipes after he refused to provide a court-ordered DNA sample in a paternity lawsuit, and later that year Snipes was turned back at the South African border when he tried to enter that country using a false passport. In October 2006, Snipes was indicted for tax fraud, accused of filing false returns in 1996 and 1997, and not filing at all since 1999. In December 2006, he voluntarily turned himself in to government officials in Orlando, Fla. Acquitted on conspiracy and tax fraud charges but convicted on three counts of failure to file tax returns, he was sentenced to three years at the Federal Correctional Institution McKean in Lewis Run, Pa. He was released in 2013. Hollywood Walk of Fame 21-Aug-1998 at 7020 Hollywood Blvd.